Vol. 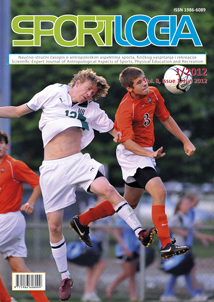 8, Issue 1, June 2012. "The cells continuously produce free radicals and reactive oxygen species as a part of metabolic processes. Increased aerobic metabolism during exercise is a potential source of oxidative stress. Also, anaerobic physical activity and oxidative stress are interrelated because the intense anaerobic activity leads to damage proteins, lipids and nucleic acids in muscle cells and blood. Complex system of antioxidant defense, which has the enzymatic and non-enzymatic part, has a role in protecting tissues from excessive oxidative damage..."
"The task constraints are prevalent elements used by coaches to train their players in sports training (Araújo, 2006; Newel, 1986). The scope of this study focuses on the analysis of spatial occupation of the attacking player in the practice space, when subjected to certain instructional constraints, on 1v1 soccer sub-phase..."
"The aim of this study is to analyse how Physical Education teachers in Portugal organise their lessons, taking into consideration the most valued lesson models. Moreover, we sought to understand the existing relationship between those practices, their experiences, attitudes and the influence of training schools, ie, the existing relationship between pedagogical work and a habitus, seen as a product of history and a defining principle of group and individual practices learned empirically in specific contexts..."
"This article draws from an ethnographic case study of a group of Muslim schoolgirls at two schools in England. It examines the issues surrounding their religious and ethnic identity and whether this conflicts with participation in school-based Physical Education (PE). Social Identity Theory underpinned the study, focusing the research and interpretation of empirical data gathered over a period of twenty months, mainly by in-depth semi-structured interviews to explicate the PE experiences through employment of a qualitative methodology. ..."
"The aim of this study was to determine the differences in physical fitness in men older than 60. Two hundred and seventy-two subjects were included in this study. All subjects were divided into five age categories, as follows: 90 subjects aged 60-64 (33%), 70 subjects aged 65−69 (26%), 50 subjects aged 70−74 (18%) 41 subjects aged 75−79 (15%) and 21subjects over the age of 80 (8%)..."
"The main object of this research was to determine the existance of statistically significant differences in physiological load of the referees concidering the period of the basketball game. The sample of subjects consisted of 31 referees, avarage age of 33.35 ± 5.17, from the A referee list of the 1st Croatian Basketball League in the contest season 2008/2009. The sample of variables consisted of the following: FSM - avarage heart rate; Fsmax – maximum heart rate; E – energy consumption (kcal/min)..."
"Amongst different methods of quality analysis of the table tennis player's game, the basic idea of this study was to detect those indicators (data) for collection of which only the final result in particular competitions in a larger number of events, of one game, or certain sets in one table tennis game would be sufficient. The basic aim of the research is to establish to what extent the indexes and variables derived directly from the results of individual table tennis games could predict indexes which are described by the final result for an individual in a larger number of individual table tennis games..."
"The subject of this research project is precision as a factor of success of the male volleyball players. The issue relates to the realization of the said motor skills through a clearly defined and valid metric tests typical for the area of technical - tactical structure of volleyball. The aim of the study was to determine the factorial structure of motor abilities of precision for male volleyball players. The task was to determine the correlation between motor tasks with the main components defined as potential factors of the research area..."
"The goal of a coach is to prepare an appropriate model of training for their athletes and provide adequate and healthy way of regulating their body weight. On a sample of 32 judo athletes of younger senior age on the territory of the city of BanjaLuka and municipality of Laktaši, a specific model of training was applied for a period of ten weeks and the judo athletes were divided into two groups. One group was the control group, and other was experimental. The experimental group has implemented 60 training sessions, of which 40 judo trainings (25 technical-tactical and 15 situational judo trainings-randoria) and 20 trainings with the load (50-80% of 1 RM)..."
"Shooting practice in youth basketball is "cornerstone" for proper shooting technique, likely, enabling the player to get high shooting percentage in a Professional League (adults). The purpose of this study was to verify the efficiency of the shooting fundamental program (n = 18, age 9.85 ± .53). Experimental groups were used in these results. The results showed the effect of shooting fundamental program. Shooting test the lay-ups after this period of an experiment was increased by +1.83 successful attempts in comparison with the result in the control time (+1.45) (p < .01). These findings show that efficiency of basketball shooting fundamental program increase shooting percentage during the period of an experiment..."